Well, I've been a busy bee lately with projects. First of all (and most exciting!) ... I finished knitting my Miette Cardigan! Hizzah! Now I say finished knitting because it's not technically completed yet. I still have to sew in the ends, block and add buttons. I originally assumed that I had some buttons in my stash - I mean, I just wanted plain white or gray buttons so you'd think I had that on hand. Yeah, turns out I don't, lol. So the sweater will have to wait to be worn until I can get to Joann's or somewhere with a large button selection. I even checked Walmart in desperation - no luck. Seriously, they might as well not even have buttons. Anyway, hopefully this week I'll finish it up. I haven't gotten to weaving in the ends because UGH weaving in ends. But I'll get over it, lol. Isn't he adorable?! I just love him. I plan on making his outfit red because that's my mom's favorite color. I think she will love him. The pattern is an old, out of print Alan Dart design for Sirdar. I've never knit one of his designs before, but when I saw this picture I just had to have the pattern. I will say, the pattern is very British. Those Brits certainly don't flounce about with any more instruction than is absolutely necessary, lol. I've experienced this before with the Zombie pattern, so I'm mostly used to it. Though I must say that they head piece came out really strange looking. Hopefully it comes together in the end! We'll see. So that's it around here lately. 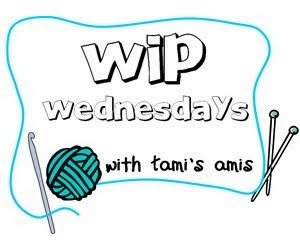 Head over to Tami's Amis' blog to see what others are making! Oh your Miette is splendid! And the bear is gorgeous - your mum will love him.